Ever since it launched the retro-styled X-Pro1, Fuji's been treading a different path with its compact system cameras, aiming deliberately up-market with a range of top-quality fixed focal length lenses for its X-mount cameras, the X-T1, X-Pro1, X-E2, X-M1 and X-A2. 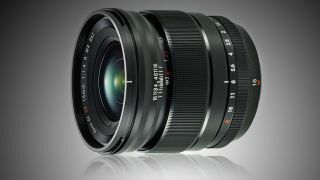 The Fujinon XF16mm F1.4 R WR is the fifth in Fuji's line-up of fast, prime lenses. The 16mm focal length is equivalent to a 24mm lens on a full-frame DSLR, and the f/1.4 maximum aperture is 2 stops faster than a regular 24mm f/2.8 lens, making this lens ideal for low light street photography, for example. This high maximum aperture comes at a price – £730, to be exact (about US$1,080/AU$1,410), but this is about what you'd expect to pay for a premium own-brand lens with these specifications. The XF16mm F1.4 has other interesting features besides its maximum aperture. It has an aperture control ring on the lens itself, which is rare today but is the traditional means of controlling the lens aperture (as opposed to turning a dial on the camera body). It's easy to see what the setting is even when the camera is switched off, and you can find the control ring by touch alone with the camera held to your eye. The focus ring has a distance scale and depth of field index markings for every lens aperture. That's not all. The manual focus ring at the front of the lens has a focus distance scale, which isn't unusual in itself, but alongside it are depth of field index markings for every aperture setting from f/1.4 to f/16. At one time all lenses had these, and they provided a clear and simple way to estimate and control the depth of field (near-to-far sharpness) in your pictures, and it's an option that's not possible with zoom lenses because of the way depth of field changes with the zoom setting. The Fuji lens has a minimum focus distance of just 15cm, almost half that of a regular DSLR or CSC kit lens, and a sophisticated two-group Floating Focus System driven by a built-in high-torque coreless DC motor – Fuji claims AF speeds as fast as 0.11sec. The new lens is weather, freeze and dust-resistant, and weighs just 375g, or 13.2oz. It completes Fuji's 'quintet' of fast prime lenses, which already includes the XF23mm F1.4 R, XF35mm F1.4R, XF56mm F1.2 R, and XF56mm F1.2 R APD lenses, and it goes on sale in mid-May.